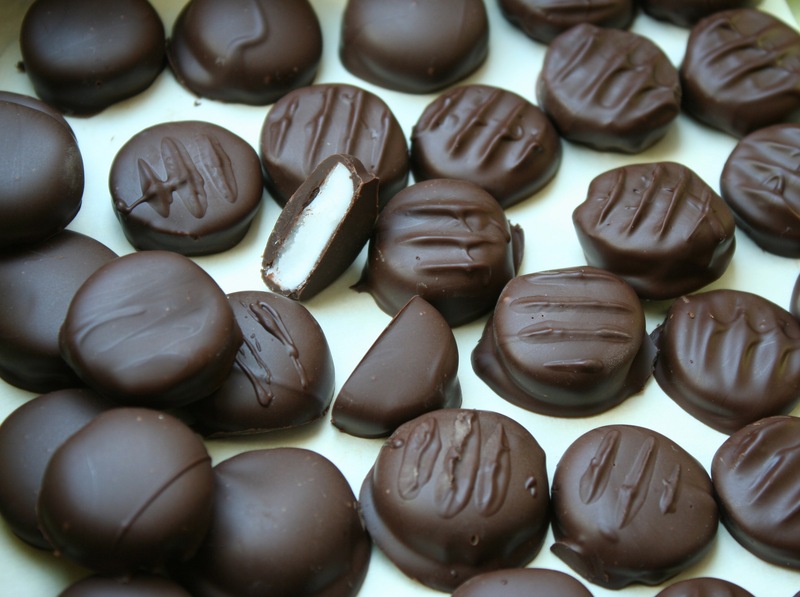 Homemade Chocolate Confections, theres nothing better ! Beat 2 1/4 cups confectioners sugar with corn syrup, water, peppermint extract, shortening, and a pinch of salt using an electric mixer at medium speed until just combined. Roll out between 2 sheets of parchment paper until desired thickness – 1/4 inch is good or a bit less. let air dry for a few hours. Dust both sides with confectionary sugar and cut into shapes and place on parchment paper. You have to do a heat –cool- reheat method to temper the chocolate. Tempering chocolate gives it the shine and the snap when it’s cool. The easiest way I have learned is to use the microwave and a digital thermometer. Carefully stir with a rubber spatula, avoiding scraping the down sides of the bowl. Stir frequently until chocolate temp reduces to 27c(80f) -this will take some time. Nuke chocolate in increments of 3 seconds stirring and checking the temp after each increment until you get to 32c(88f). it will be fast. Using 2 forks to hold the patty, dip into chocolate and place them on parchment paper to cool. If chocolate gets too cool microwave in 3 second increments and bring it back to 32 c.
To avoid fingerprints on finished chocolates ,wear a rubber glove when handling chocolate . Store chocolate in airtight container. This entry was posted on Thursday, September 20th, 2012 at 6:57 pm	and tagged with candy, chocolate, home made, patties, peppermint, sweet, vegan, york and posted in Category. You can follow any responses to this entry through the RSS 2.0 feed.